So many times the food that I eat and post would be forgotten if I didn’t take photos of it. But what would be the fun of doing a What I Ate Wednesday post if I didn’t have photos? Well I have done it without photos once when computer demons were wreaking havoc on me, but this week we’re good. It was a tough week emotionally for me for various reasons, and I will confess that not Everything made it into a photo. I’m also not proud of everything I ate, but as I like to say, it’s gone and it can’t hurt me anymore. I am proud that I said “no” to an apple fritter at WaWa at Least 3 times. Never did have one and that’s Ok by me. WIAW is of course the baby (soon to get a little sister!) of Jenn at Peas & Crayons. Be sure to check out all of the fun happening at P & C when you’re finished here. This isn’t actually Love Your Veggies Month, but I like this logo and I sure have my share of veggies in this post! After Ralph’s regular doctor’s visit we went to one of our favorite lunch spots. I got my usual there, the Athenia Burger. It’s the Greek salad with a substituted veggie burger on the side. This is so good. They cook the veggie burger just right and the Greek salad is just enough. Yum. Salad in the Big Purple Bowl with Morningstar Griller chopped up! Very tasty and filling. 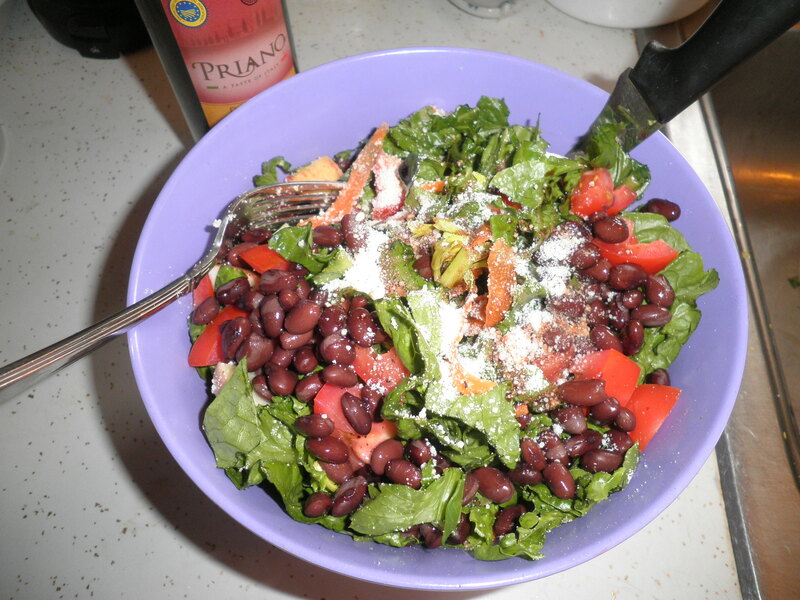 This is actually a different salad, this time with canned black beans. They taste better home-made, but keeping some canned beans in the pantry is such a good idea. Another thing I’ve been adding lately is a chopped up Gala apple. So tasty. I’m getting back on track though and there are some pintos cooking in the crock pot as I type this. The BPB just loves to be part of WIAW! We haven’t gone to Subway in a while and Ralph suggested it one day last week and I said Yes! 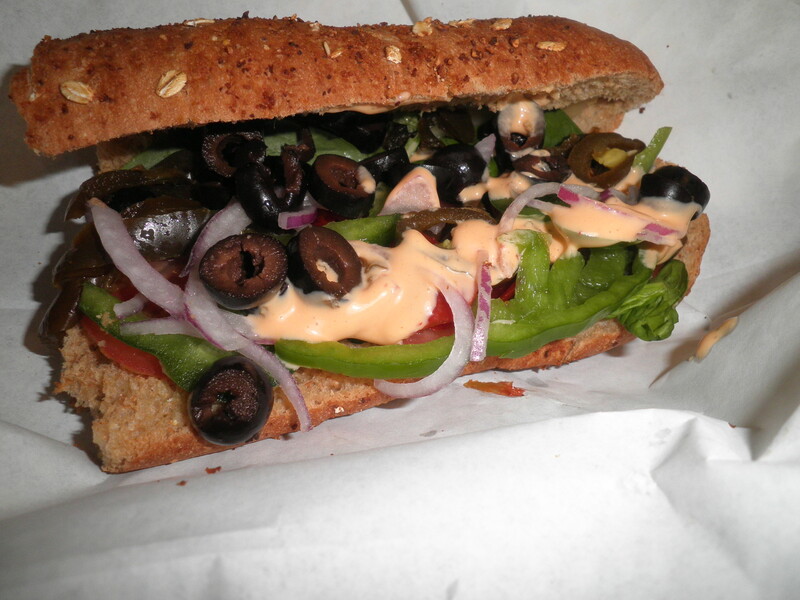 Honey wheat bread, pepper jack cheese, spinach, tomatoes, onions, green peppers and black olives with chipotle southwest sauce. Really tasty. My new favorite combo-black raspberry and peach. This doesn’t look it, but I was controlling myself and got a small instead of a medium. So good. I guess that’s a good place to stop! As I say, it was not the best food week, but I have no photographic proof so you can believe me or not. I just like to be honest. I’m feeling more in control now and we’ll move on from there. I’m sure everyone has a week like that now and then, I just haven’t had them lately and it’s a little scary when it happens. I’m feeling a little closer to the top of my game. I think the weather has something to do with it. This rain is putting me in a terrible funk. How do people live in a place like Seattle where it rains all the time? Just makes me more determined to get to New Mexico SOON!! P.S. 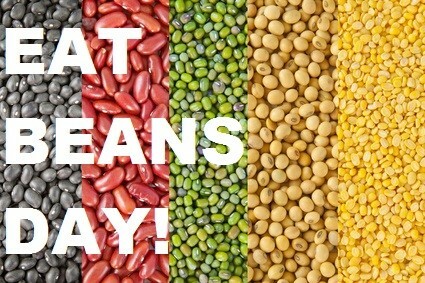 It’s Eat Beans Day…DO IT!! This entry was posted in Uncategorized and tagged beans, Big Purple Bowl, crock pot, WIAW. Bookmark the permalink. I love your salads! My mom always put apple on salads trwing up. I need to start doing that more! The apple adds a nice twist to the salad, Laura! Bulks it up too. Have a great day! I can tell that’s a small cup the ice cream is in! We use small cups when we have a dessert – it really helps with portion control and we still get the enjoyment of the treat. You have a Very practiced eye, Diane!!! 🙂 I’m impressed! It does make a difference. It tasted just as good and I couldn’t really tell I was reducing the size. Have a great day! Sorry to hear it has been a rough week, hope it picks up soon. Your salads look divine! It’s improving, Claire! I love my salads and I like them big. They make me very happy. Thanks for visiting and please stop by again! Happy WIAW! I like the looks of your Greek salad and veggie burger. 🙂 You did deserve ice cream after a yard sale!!! So much work, I hope you got rid of a lot. 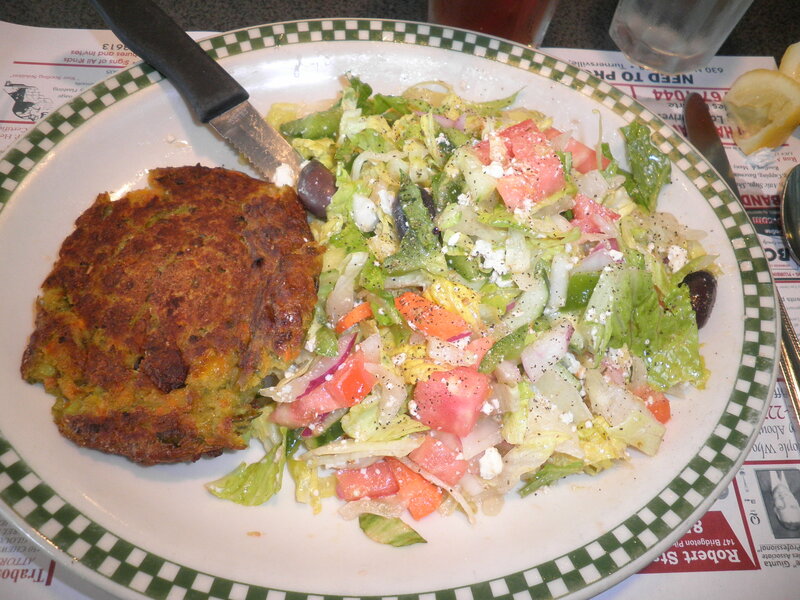 Jennifer, the Greek salad/veggie burger combo is one of my favorites! The yard sale helped me get rid of a LOT and has motivated me to get rid of more! Have a great day! Thanks, Jenn! I try to stick with a positive attitude. Things get me down sometimes, but I work hard to get out of it quickly and back on the positive side. Thanks and have a great day! I think all of your eats look wonderful! I’m especially eyeing all of those salads and that ice cream (of course ;)). I’m not a huge fan of black raspberry, but I love peach anything! Also, I’m so glad you commented on my blog so I could find yours :). I can’t wait to read more! Hi Christine, thanks for visiting! Love my salads! 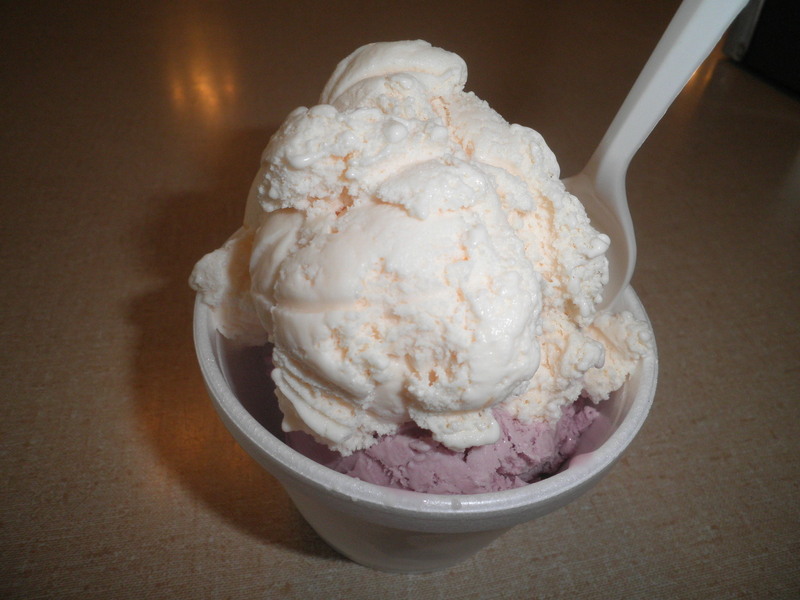 The black raspberry is a very subtle flavor and it really goes well with the peach. So Good. Please stop by again. Glad we found each other! Sounds like you deserved a little ice cream! I love black raspberry! This ice cream is So good, Stacie! The place is owned by a guy I’ve known since kindergarten and went all through school with. It’s fun to have a hometown place like that. Salads are just the best, Liz. I’m a volume eater, need a lot to feel satisfied. 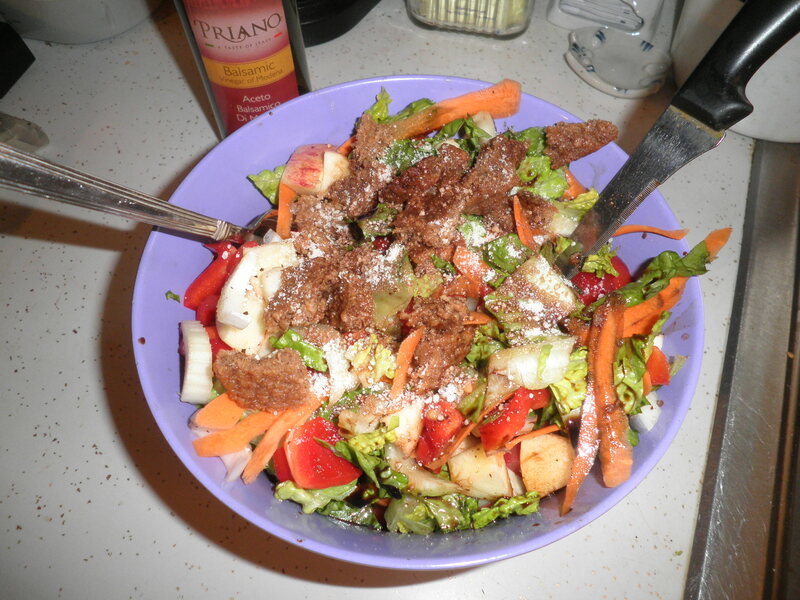 I can easily do that with a salad…lots of good veggies, some protein (beans or a veggie burger) and balsamic vinegar. I’m all set! I don’t get bored with it either, so I can have it over and over with a few variations. I’ve been adding an apple in lately which makes it very tasty. Have a great day! I missed national bean day! And I still want to show up in NJ for one of those veggie burgers. I hope your week has turned around emotionally Fran! I can’t wait ’til you get to NM! It’s been such a long time coming, and I know you’re going to be so happy there! I will and you will come to visit!! I need to let you know when we’ll be in Nashville in September. I’ll check out the dates and let you know when I’ll have free time. Just got the schedule. I’ll let you know over the weekend!!! Ooo, I can’t wait! Yep, let me know what your schedule’s going to look like! I love apples in salads, especially with a wedge of cheddar. Mmm, great flavor combo. No worries about the bad week; just pick yourself up, move forward and try again. That’s about all you can do anyway. Plus, a little ice cream is good for the soul, especially when it’s made with whole food ingredients. Love me some ice cream.